Public transportation can deliver shockingly abrupt changes to normally slow-moving cyclotourists and that was the case in taking the 9 hour overnight ferry from Dubrovnik, Croatia to Bari on Italy's southeastern coast. We went to bed having the Croatian language, culture, and currency shaping our days and the next morning it was back to the Italian language and the Euro. We'd made this journey to Bari before and hadn't any great memories of it. Our prior experience with a poor-value, inner city hotel in the throbbing port hub short on tourist attractions had us planning to pedal out of Bari as quickly as possible. But the warm, fall morning air was more inviting than our previous arrival in the chill of winter and lingering for some necessary shopping was quickly rewriting the Bari script. 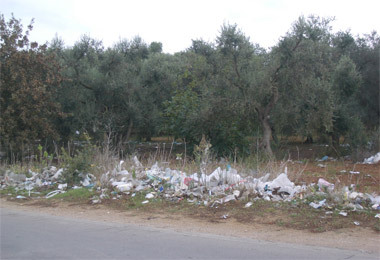 Roadside litter collecting in an olive grove. Bill deposited me and our loaded bikes in a manicured, inner city park while he headed out to tick-off items on his chore list: maps for the next 2 months; Farewell to Arms in Italian; a guide book for Tunisia, just in case we detoured there; lodging information for the region; EU cash from an ATM; and bread and tuna to complete our lunch. Unlike in Croatia, he was able to easily do all of those chores in an hour. The greater affluence of decidedly urban Bari made running errands a snap, especially in comparison to anywhere we'd been in Croatia. I took my turn to do a little window shopping and as a consumer, felt the relief of being out of Croatia, of being where there was more of everything. What a thrill to go into a multi-storied bookstore and see all of the possibilities. In Croatia, the bookstores we found were mini-market-sized. I celebrated the diversity by purchasing a $5, pocket-sized Italian cookbook to round out our vocabulary lessons. It was a joy to be immersed in abundance, to be surrounded by choice instead of being in more of a "make do" consumer environment. We left the city after picnicking in the park and the differences between Croatia and Italy quickly blurred. We rode along the coastline, which had a similar feel to Croatia. The half-finished buildings, the occasional piles of trash and roadside litter, and the crumbling infrastructure seem to be a common theme in the Mediterranean countries. 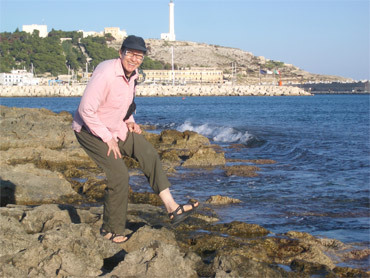 The coastline around Bari was however pancake flat, whereas Croatia's coastline is a constant wiggle, both in the vertical and horizontal planes. Predictably, the first afternoon of riding in Italy was easier, but not as pretty as our days in Croatia. The following morning's ride underscored other welcome differences between Croatia and Italy, which were the price and availability of food. Inexplicably, food in Croatia is 2 to 3 times higher than the EU, even though the standard of living is substantially lower. And it isn't just on the imports either, as even the prices on Croatian produced items like their olive oil were high, even higher than some of the imported Italian products sold in Croatia. 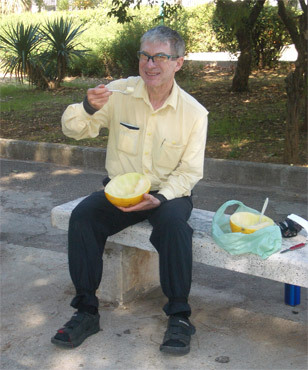 Our "Welcome to Italy" melon break. With Croatian prices still my standard, I stopped at a town square vendor's table eyeing his brilliant yellow, casaba-like melons. I settled on my top price, which would be about $4 for a small specimen. I had to confirm my translation with Bill as I couldn't believe it when the man quoted me the equivalent of about 45 cents a pound. We walked away with a hefty melon and 2 tantalizing persimmons for about $2--an unheard of value in Croatia. This detour immediately lead to a second, which was into the adjacent park where we cracked open the melon after giving it a quick rinse. Images of daily, mid-morning melon breaks filled our minds as we slurped and savored the luscious fruit. It wasn't long until our route drifted slightly inland as we headed southeast along the heel of Italy's boot. Bill expected quieter roads and more pleasant scenery off the coast road, though he didn't anticipate the riding to be so enchanting. The trashiness of the flat littoral region quickly gave way to a tidier appearance and more hills, though it was not particularly high. The land looked more cared for, more valued, and the new rhythm of changing shapes and colors was very pleasing. It wasn't spectacular scenery but consistently pleasant, which is good enough, especially under the brilliant autumn skies. Bill had been a bit too cool about what was to soon pepper the scenery, which were the rustic yet surreal trulli stone homes. 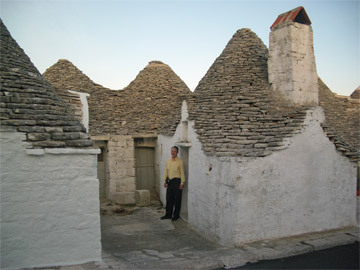 For centuries, until 1797, the locals were not allowed to use mortar on their homes and settled on a beehive-shaped stone building style--the trullo. During our several-hour approach to the hilltop city of Alberobello, we saw the little buildings in isolation or small clusters. But it was still a shock to find a sea of hundreds of these rustic homes in a centuries- old urban setting at Alberobello. I expected a walk among the squat, rickety looking stone dwellings to be one of those penetrating experiences that would take me back in time, like walking Dubrovnik's ramparts for the first time or tripping through the teaming back alleys of Cairo in 2006. But my voyage through Alberobello's time machine was derailed by the intense commercialism in the stone labyrinth. My eagerness to cross time boundaries wasn't enough to filter out the pervasive souvenir shops. With every turn I made expecting to be shielded from the hype, I was confronted with yet another row of vendors. And I could imagine that staying at the 5 star hotel that boasts a 'trulli experience' wouldn't take one back in time either. 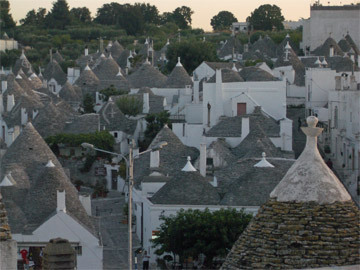 Alberobello's trulli town. A closer view of trulli's, now with the benefit of stucco. Disappointed with the retail sensory barrage, we turned our attention to the more authentic looking trulli, the ones outside of the central cluster and those outside of the city itself. It was in those places that the simplicity and harshness of that earlier lifestyle was palpable, it was there that we could imagine another time. 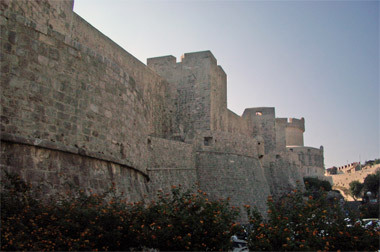 Dubrovnik's more massive take on fortress walls. From about the same era as the trulli, roughly the 1400's, the cities of Locorotondo and Martina Franca could not have been more different from the originally mortar-less Alberobello. The step back in time they offered was not of the harsh, rustic, and simple lifestyle but that of grand building sprees--with mortar. Trulli were made of rough hewn stone collected in local fields where as these other cities were built of finely dressed, quarried stone with later baroque flourishes. These were dignified old cities, poised on the low hilltops, surrounded by stone walls with humbling gates. It was interesting to drift back through my memories of being in Dubrovnik, Croatia earlier in our week, a "must see" city in my book for giving one a sense of life in a walled city centuries ago. Being in Italy highlighted why Dubrovnik is unique in the Mediterranean, as it is a profoundly walled-in city. Not only do Dubrovnik's massive walls still completely enclose the old town, but they are as high as the tops of the multi-storied building rooftops. Walking around the perimeter on the old city's ramparts and looking down into the town is dramatic. One feels that all that's missing to completely protect Dubrovnik is to have a lid on the top. In contrast, these lovely Italian walled cities were "walled around" not "walled in." They were more defensively situated on low hill tops than seaside Dubrovnik, but the Italian cities' enveloping walls were short of the 3 storied buildings contained within. Once inside one of these Puglian cities, the walls dropped from your awareness, which was never the case within Dubrovnik's more domineering walls. Our Lonely Planet guide book referred to Locorotondo's interior as a "warren of streets" and I realized I could not readily define "warren". My electronic dictionary made reference to "a network of rabbit burrows" and "a densely populated or labyrinthine district" and the later was an apt description of what we were experiencing in the Puglia region. Again, it was interesting to think back to Dubrovnik. 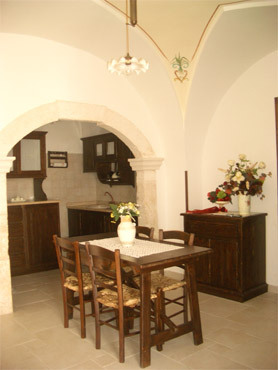 Though more convincingly "walled in," Dubrovnik's interior wouldn't qualify as a "warren". It has a consumptively broad central street and many of the secondary streets form a neat grid. 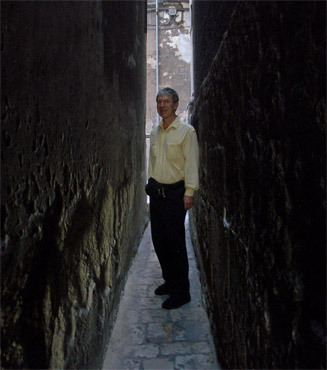 The narrow stone alleys are enchanting, but very regular and linear feeling. Even for a visitor, it is hard to become disoriented in Dubrovnik. In contrast, the small southern Italian walled city of Locorotondo felt like a place in which I could easily get lost. 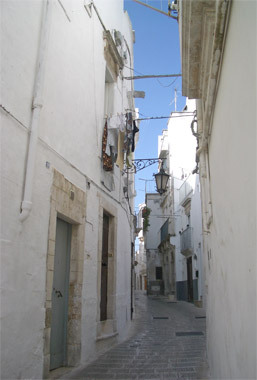 And in the larger Martina Franca, I found myself doing orienteering by the laundry hanging from the balconies that I was seeing for the second time as the blind alleys, twists and turns, and dips were disorienting and the street names of no use. Italy is one of those many Mediterranean countries in which one is confronted by endless walls of closed doors and windows in the town streets during siesta. It's like being the in Twilight Zone for us. The whole town can be devoid of life and sometimes the paucity of business signs leaves one clueless as to what lies behind any of those closed doors. slatted doors; a market was behind the metal window. When siesta is over, which can be anywhere between 3 and 6pm, the clattering of the roll-up metal doors in motion signals that the secrets are being revealed. Fruit vendors, stationery goods, bakeries, and other small markets come out of hiding. Some of the wooden bi-fold doors of residences will open, usually disclosing a curtain of a strand-like door covering. I was often taken aback by all the lively commerce that was within a few feet of our latest lodging once siesta was over. We stayed in ground level apartments in both Locorotondo and Lecce, apartments that were in irregularly shaped and endlessly meandering buildings. Our street-level quarters, like all the other nearby ground level spaces I peeked in, had barrel vaulted and domed ceilings. Those tunnel-shaped ceilings plus the twists, turns, and jogs in the floor plan suggested that Locorotondo and Lecce were "warrens" inside and out: the streets were a labyrinth, the interiors were like rabbit burrows. Hints of the domed & vaulted ceilings of our apt. Presumably the upper 2 stories gave way to square ceilings, but the sturdy shape of the base layers all seemed to rely upon the dome. And like many of the cave-like homes we'd seen in similar old towns over the years, our 3-roomed apartments had no windows. The only glass was on the smallish doors and those had wooden covers latched over them. I often get a restlessness that borders on claustrophobia when I can't see out of a room, but fortunately our apartments were so charmingly decorated that the cozy-burrow feeling overcame the trapped-animal response to the tunnel like spaces. Circumstances conspired against our usual plans and on one of our first days back in Italy, we were suddenly in sync with the local rhythm: we had lingered in the small city park at hilltop Martina Franca for almost 3 hours. First, we needed to eat lunch and then we took turns watching the bikes and touring the old town on foot. The sunny warmth of the early October day made it easy to sit and being freshly stocked with a guide book for Tunisia, Farewell to Arms, and a tiny cookbook--all in Italian--meant that we both had plenty of reading we were eager to begin. We watched the hoards of young school kids with their parents troop through our park on their way to lunch, which were then followed by waves of unescorted, restless teenagers. We listened to the metal, roll-down doors bang shut as the merchants across the street each closed for lunch (including the restaurant). The city became quiet and eerily still. It was just us, the pigeons, and a few inebriated men looking at the betting newspapers still out and about. Shopping, going to museums, or asking for directions during siesta in Italy is hopeless and we've always known that the proper activity for us was to be resting too. But others have homes to go to at midday and our home away from home doesn't materialize until evening, so this was a rare opportunity to 'go Italian' during siesta, though on a park bench. The only problem was when it came time to continue our day's journey, our nervous systems went into a state of shock. Shifting from the intoxicating tranquility of the hours of relaxation put us in a compromised state for dealing with Italian traffic. To them, the nudging, prodding, pushing, and darting they do with a car is normal whereas we feel like we are under siege. I struggled to rally the concentration and resolve needed from my drifty mind to safely be in the fray. Opening car doors, cars appearing out of nowhere, and deep holes on the steep downhill city street all came at me too quickly. Somehow we managed to navigate through the turbulent urban traffic and then we were thrown out on a main road with the trucks. It was a harsh reminder that our usual rhythm was probably safer. Better for us to be pedaling during siesta when the traffic volume is down and to have our skills well honed when the post-siesta traffic press begins. Self-discovery on many levels has been one of the luxuries of extended travel. Constantly changing living spaces, shattered old routines, social isolation, new challenges, simple living, and immersion in other cultures are some of the elements of travel that put multi-faceted mirrors before us each day. We see ourselves differently than before because of it. One particularly amusing discovery when in the Mediterranean region was realizing that Bill and I both go into a little trance when we ride through a pine forest on a day hot enough to layer pitch resin aromas on the breezes. We both inhale the fragrance deeply and slowly to savor it. 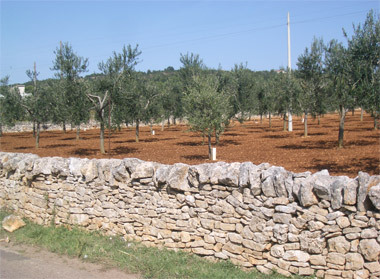 Olive trees, not pines, are rooted in Italian traditions. For both of us, that hot-day pine resin scent was wired into our psyches as children. We only smelled that aroma when camping with our families in the mountains. And that particular scent only occurred if it was sunny and very warm, perhaps hot. The subsequent association was that everyone in the family was a good mood because we were experiencing the hoped-for good weather on the much-anticipated family vacation. Forever more, we'll both have a little high when we catch that particular scent in the wind--a scent tightly linked with happy times as children. Just as wired-in as this "pine resin scent = good times" are the social or cultural routines that put us at ease. We are very aware that we feel the most at home when in the northern European countries like Switzerland, Germany, and Austria. In those countries, our expectations of mundane routines are met: the traffic stays in the lanes, the next person in line is the next served, pedestrians cross the street when the "Walk" sign is green, and business hours are posted on the door. Those aspects of daily living move into the background when in northern Europe as there are few surprises, all is as it should be according to our US upbringing. But for those with a northern European cultural bias, moving through public spaces like one is in a smooth running factory is not what happens when in Italy, especially southern Italy. We've been there before, we know to expect it, we know what is normal for the region, and it still knocks us off center. The sense of well-ordered factory routines when mingling with the public shifts to chaos. To us, the Italian behavioral norm looks like a herd of sheep in startle response. Instead of neat rows of cars and people, we are confronted with a scene that looks like scared sheep running every-which-way, then ending in an immobilized clump. Italian traffic looks like a nightmare to us. Traffic lanes and directional signs appear only to be suggestions. Cars driving backwards on streets and either direction on sidewalks are ordinary sightings. There can be 3 oncoming cars side-by-side on a 2 lane highway in a passing frenzy. And we sometimes think we are going the wrong way on a 1-way street as most of the cars parked on the right side of the road are parked coming towards us. When school lets out for lunch, traffic in some towns becomes a snarl and then stops entirely. In addition to string of broken rules in traffic, our pragmatic side is offended by all of the stores in a town or region being closed on a particular weekday as a regular rest day, but with no signs on the door saying so. And except for the fashion stores and largest supermarkets, generally no business hours are posted at all. If hours are posted, they often aren't accurate. And there certainly is no express line in the market to bypass the single clerk who has become totally occupied by gift wrapping a half dozen packages for a customer. Our hard-wired expectations perceive the traffic as aggressive and dangerous; we see the lunchtime school routines and gift wrapping at grocery stores as avoidable inefficiencies; and the irregular and un-posted business hours register in us as absurd. But it is Italy, and the people are wired differently from their childhood. It's all normal to them; it's the way they expect things to be. 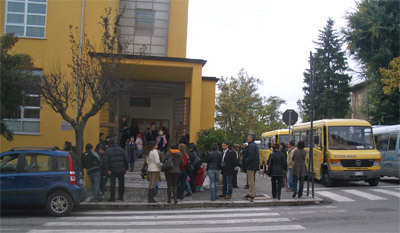 The tension begins to build outside the school though order still prevails..
We remind ourselves that their driving style isn't aggressive by their standards and I'm sure that the drivers aren't experiencing a flood of stress hormones as American drivers would in the same situation. We no longer look at the chaotic array of motorists converging on a single point at an intersection as aggressive driving but instead see that each driver is merely disclosing what they want: both where they want to go and that they'd really like to be next. No one usually pushes the point. If we are in the fray, we need to decisively take the right of way when it is ours, and no one takes issue with it. We get our turn, but we must be clear about our intention. It's a "announce yourself" driving culture, not a "it's your turn" style. Watching the parents and grandparents converge on schools in cars, on bikes, and by foot at lunchtime is a bizarre sight. It often coincides with our lunch break and we watch from park benches in amazement. Special police and monitors are out there blowing whistles, directing traffic, and managing those insistent motorists. It looks like a stunning waste of resources, both directly used in organizing the chaos and indirectly for all the other people bogged down in the jam. And yet how treasured each child must feel when met and escorted home at lunchtime as the traffic comes to a standstill for the ritual. The same social affirmations as for these children occur at the markets where all commercial activity freezes for as long as it takes for the clerk to wrap a customer's single or half dozen gifts. I've learned to go on to the next market if I can when this social routine is unfolding, especially if I'm making a single purchase. My sense of efficiency and productivity is wildly offended by these scenes, but that is the courtesy that Italians have grown up expecting to receive as customers. I can't imagine that we will ever become at ease with the traffic chaos and the commercial inefficiencies that permeate our days while in Italy as we were socialized to a different standard. But with each visit we are more quickly able to remind ourselves not to judge the conventions by our expectations, but instead to accept that this is the way these folks are wired--its their version of 'pine resin scent' programming. When in the grand old city of Lecce on Italy's boot, I quickly found myself describing it as an oasis. We'd ridden for hours through the ugly littoral lands from Brindisi. The flat and overused, disused, or abandoned land looked pitiful. It was hard to imagine what would revive the earth to make it vital again. It had the look of harboring a contagion that I didn't want contaminating my mind or my body. 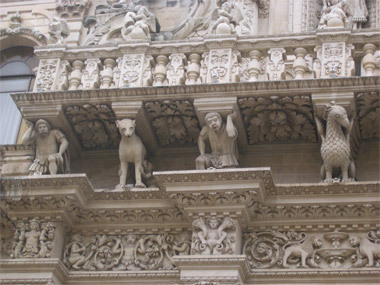 Lecce's gargoyles kept the dreary land at bay. Coming into Lecce, even in the rain, was a delight. The once walled city with its labyrinth of narrow streets still had a walled-in feeling, which was welcome. I wanted that dreary land kept out there, held safely away from us. I was delighted with the secure feeling of the old town and to be able to turn my attention to the grand architecture for a pleasing visual experience. Usually it's the other way around, usually we are happy to move out of confining urban spaces to a park or the surrounding land. But here it was different, here we wanted to be rescued from the wasted-appearing land. Lecce felt like an oasis surrounded by empty desert. I was ironic to be calling this city an oasis after having been in 2 Egyptian oases in 2006. 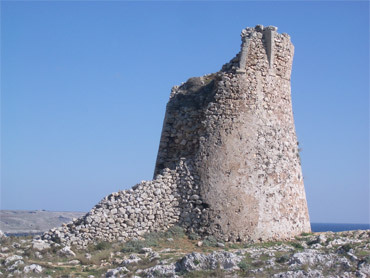 The contrast between Lecce and its surroundings was greater and more dramatic than between Siwi Oasis and its desert surroundings. In Lecce, the difference was night and day: featureless, scruffy, beat-up looking low land gave way to beautiful buildings, interesting plazas, and lively people energy. In Siwi, Egypt the parched, sandy desert followed us into the oasis, with the 1 and 2 storey buildings being made of the same material. Nowhere in Siwi were there the lush green gardens that had been my image of an oasis. The oasis water in Siwi and the other oasis we visited was well channeled to support date palm and other dry-looking trees in isolated orchards. The dust still kicked up around our feet when we walked and there was nothing pleasing about any of the vegetation. The oasis did provide shade and water for the weary, but little visual relief. In Lecce with its wonderful sensory experiences, I found myself needing a new word to replace what an oasis used to represent. 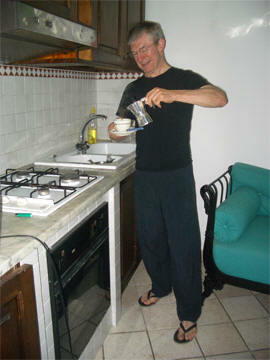 Learning to use the apt's espresso maker in Lecce. We extended our stay in Lecce from 3 nights to 5, with the short answer being "Because of the rain". But the long answer sheds light on the convolutions of our cyclotouring reality. Once we arrived back in Italy, we did a little too much shopping. We could absorb the 3 books in Italian, but it was that space heater I bought that pushed us over the edge. Bill had long fantasized about having our own space heater for winter travel, so when I stumbled across a compact number at a grocery store for $12, I grabbed it. At a maximum of 800 watts, we wouldn't risk blowing fuses or blowing our cover in hotel rooms. I had correctly assessed that I could stand the slim heater on edge and squeeze it along side the bag of food on my back rack, but it was acting like a fin in the winds as it made my load both wider and higher. I feared that in windier winter weather sure to come, it would compromise my bike handling. And, being back in Italy, meant Sunday store closures and so on the weekends Chuck, the food bag, would be bulging from extra inventory plus being squeezed by the heater. Clearly something would have to go. The most expendable items were the Croatia and Slovenia guide books I was hanging on to. I was saving them until the file on the cultural comparison of those 2 countries was completed. When Bill reads what I've written just before uploading on to the webpage, he often disagrees with a detail or 2 and we have to 'duke it out.' I was saving the books as impartial references for those discussions. We decided to make a rare layover for the primary purpose of writing so I could complete 3 web page files. So, the long story for why we laid over in Lecce was really: so Barb could write, then 2 books could be thrown out, and her bike would handle better in the wind even with the extra bulk of the new heater. Being off the road for 5 days of the 8 day rainy streak looked good in hindsight too. Dipping a "Heel of the Sandal" in at the tip of the "Heel of the Boot." At the all but buttoned-up resort village of Marina di Leuca, we reached the southern most tip of the heel of Italy's boot. It was one of those moments that looked significant on the map, but hardly showed on the ground. The convolutions of the coastline obscured it's geographical significance and I instead remember the approach to it as having higher roads, better panoramas, and an insistent tailwind. Once reaching the heel of Italy's boot, our route was to take us along the sole of the boot, with the first big stop being at Taranto. But unlike sleepy Marina di Leuca, Taranto, with its population of 200,000, was a fright to bike into, especially after days in the quiet isolation of the deserted seaside resort villages. The suddenly appearing trucks made being on the narrow, 2-laned highway a nightmare. Intermittent shoulders and disintegrating pavement gave us the "industrial grade" experience of the city without actually being in its notorious, heavy-industry area. After feeling like we'd been dodging bullets for hours on the open highway with the trucks, it was yet another shock to merge with the city's tightly packed, start-stop traffic in the deeply shadowed urban corridors. After these dual challenges, our traumatized nervous systems hardly knew how to react when we abruptly exited the urban-industrial chaos and were delivered onto a broad seaside walkway and then a lovely city center park. 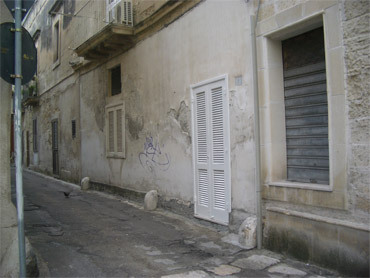 Taranto's streets could be disturbingly narrow. A roomy formal park occupied much of the central space between the narrow peninsula's 2 seas and the green area was the terminus for a grand pedestrianized shopping district. It was one of those city-centers of Italy that become electrified at night--places were a stranger can slip into the stream of promenaders during the evening "passeggiata" stroll and savor the lively, collective energy. Taranto's old city, "Città Vecchia," across the bridge from the sparkling retail district and park was yet another jolt in this span of only a few miles. Here, one is compelled to accept the guide book's advise not to be there alone at night. Our search for an archeological exhibit had us exiting after dark but we carefully joined the other walkers on the rampart adjacent to the sea rather than feel like rats in the dark maze of the forbidding old town. But in the daylight hours, the tiny old town of Taranto was mischievously beckoning. The widest and most heavily traveled street had only the occasional car squeezing past the few other pedestrians. Searching for the exhibit had us spending hours in this district instead of the half hour we'd planned, but each pass through emboldened us to deviate farther from the most inviting of the streets. Some turns had us tentatively walking past half boarded-up buildings and piles of trash and then the next turn might reveal a crumbling relic being shored up with a few rooms nearly ready for occupancy. Another twist and we were in a fully-inhabited segment, with the ladies of the house easily carrying on 3-way conversations between several 2nd storey balconies. Many of the forbidding streets were too dark even in daylight to successfully photo. Life on Taranto's brighter streets in Old Town. In the midst of Taranto's dark decay, "gentrified" immediately came to mind as a way to describe the other Puglian old towns we'd found so delightful in places like Lecce, Locorotondo, and Martina Franca. They must have been cleaned-up and gentrified and in contrast, Taranto was not. Taranto had a raw, rough, and forbidding exterior, though the activities of the residents were like those of any other community. Perhaps what was before us in Taranto was what those other cheery old towns had looked like for most of their 500 or more years. Perhaps a cleaned up Taranto would look charming instead of threatening. A few remnants of a grander time in Taranto could be seen on the occasional portal, but it was the almost enveloping, uninterrupted black grime of the stone streets and stucco surfaces that defined the experience. Like the others, Taranto streets were a labyrinth, but Taranto's seemed more menacing. Perhaps the streets were narrower or maybe the dingy surfaces that prevented any play of light where direct light never struck shrank the sense of the space. Wandering the narrows of Taranto's old town was one of those cherished experiences that travelers hope to tumble into--an experience that activates all of your senses and adds a layer to your deeper understanding. 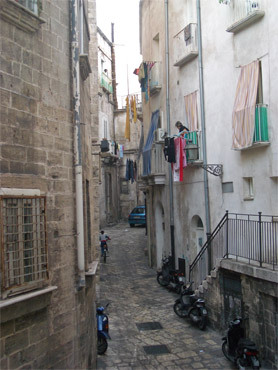 We left the back alley world of Taranto with our sensory memory more tightly packed, ready to fill the gaps the next time we visited a spruced-up old town or read about "life when....."
Remnants of less ancient cultures. Taranto was our last major stop in Puglia and the ancient Greek history of the region unfortunately had been left to our imaginations. There had been tantalizing bits in our guide book about the coastal towns around more northern Otranto as having begun as Greek settlements and of places where the speaking of Greek had only recently ceased. We read that Taranto was founded in the 7th century bce by exiles from Sparta and grew to a city of 300,000 (larger than it is today) but there was little exposed to reveal that past. Their museum, considered one of the most important archeological museums in Italy, apparently suffers from a common syndrome--terminal-renovation--and is effectively closed permanently. An obscurely located temporary exhibit was more striking for its prehistoric finds than its Spartan past. The other Puglian archeological museum, in Brindisi, was also closed indefinitely. So, disappointed, we left the Puglia region with its ancient Greek history being a stray bit of information floating in and out of our minds, rather than a knowing anchored by potent visual experiences. We've just completed our preliminary loop of western Sicily and are back in Tràpani on the northwestern tip of the island. Our biking loop began and ended in Tràpani as it is the departure point for our flight to Germany in 3 days. We arrive in Dusseldorf on Saturday, December 1 and on Wednesday the 5th we'll fly to Portland from Frankfurt on that wonderful, relatively new nonstop Lufthansa flight. Somewhere in between we'll be taking a train to Frankfurt. As always, it is a time of conflicted emotions. On one hand we look forward to reconnecting with family and friends back home; on the other, it would be simpler to just keep pedaling.